Quantico, VA- If the Super Bowl’s not for you, the Puppy Bowl is always an adorable alternative aired earlier in the day. There’s even more reason to watch it this year—local rescue puppy with a purpose will be competing for the coveted MVP title and a Lombarky trophy for their team. Pete, a rescue pup who is currently training to be a service dog for a disabled veteran, will compete in Animal Planet’s Puppy Bowl XIV on Feb. 4 at 3 p.m. on Animal Planet under the name Alvin. Pete is one of the thousands of dogs adopted from Operation Paws for Homes last year. Operation Paws for Homes is Semper K9’s official rescue partner and Pete’s sibling Duff will also be included in pre-coverage for the event. “We are excited to see Pete compete in the Puppy Bowl and score a touchdown because we know he will score many more touchdowns as he helps his service member later in life,” said Nate Newhouse, Semper K9 volunteer, and Pete’s K9 Coach. Operation Paws for Homes will also hold a Puppy Bowl viewing party at the Wag & Brew (614 S Pickett Street, Alexandria) from 3 p.m.-6 p.m. The event is free, and both Pete and Duff will be in attendance. The event is a fundraiser for Operation Paws for Homes. Started as a platform for pet adoptions, the Puppy Bowl has become the can’t-miss, cutest sporting event on TV. 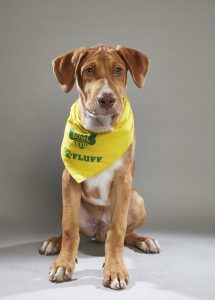 Rescue dogs on teams “Ruff and “Fluff” take the field to attempt scoring the most touchdowns with dog toys—if they can avoid getting penalties from the “rufferee.” The Puppy Bowl has been a Superbowl Sunday tradition since 2005.